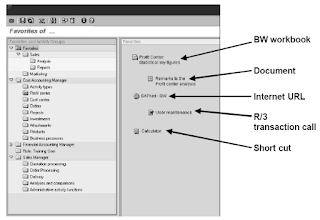 If you require a specific report, you should first check if you find it or a similar report in Business Content.In Business Content you can find all objects that lead to fast data extraction from the R/3 OLTP systems, and that allow you an extensive analysis of this data. 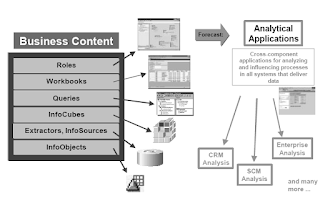 Business Content contains numerous objects that simplify the implementation of BW and accelerate the construction of an effective reporting system.These objects are grouped together to enable you to use them effectively: For all areas of your company and for many industry sectors, there are roles that provide users with the relevant reports and applications that they need to perform their tasks.In the future, cross-component applications called Analytical Applications will be available to provide direct access to all the information related to a process. They allow you not only to analyze these process, but also trigger actions and reactions in the systems that deliver data. 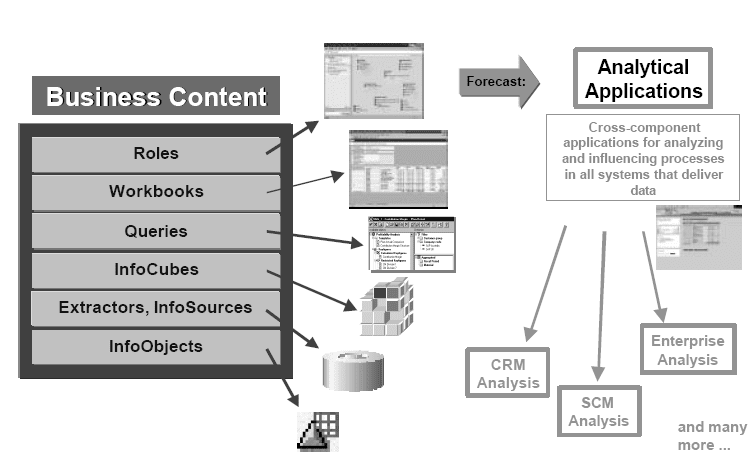 Areas particularly suitable for the implementation of Analytical Applications are, for example, Supply Chain Management (for example, supplier and catalog analysis, manufacturing analysis), Customer Relationship Management (for example, e-business analysis, market exploration) or analyses within the company, such as performance analysis, payment analysis, or human capital analysis. 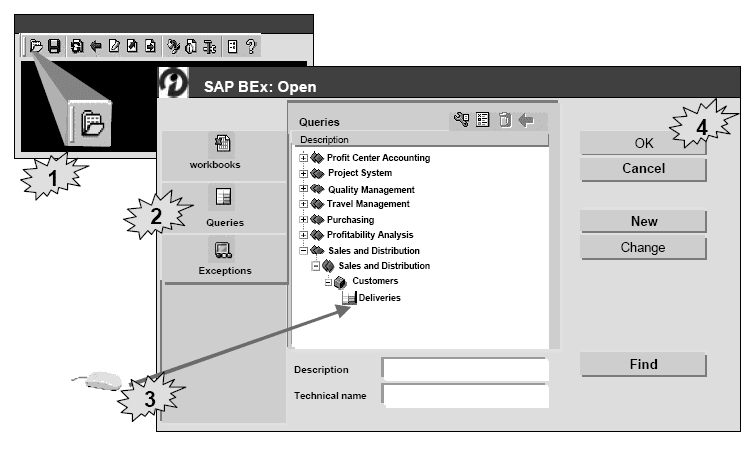 You can find the query definitions delivered by SAP in the BW menu under Business Content -> Object Types -> Queries -> Sele ct Objects. 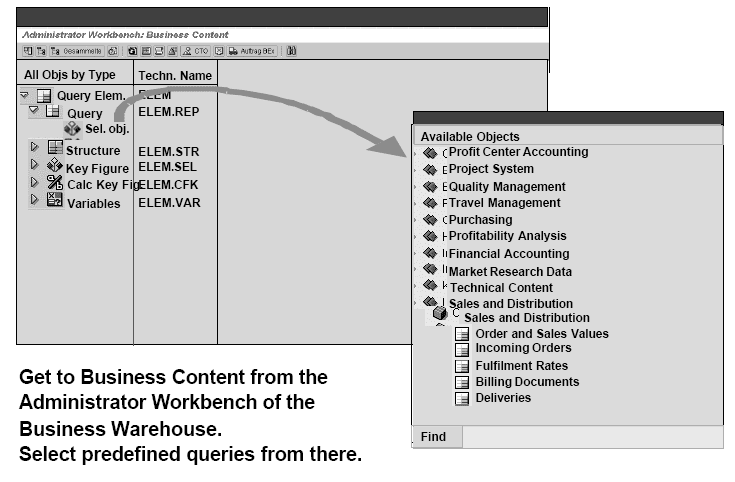 Clicking on Select Object brings you immediately to a selection menu with all the queries in Business Content. They are listed under the corresponding InfoAreas and InfoCubes. An integrated search function makes it easier to find queries from certain areas. When you have found the query definition you need, select it with the mouse and choose Copy. 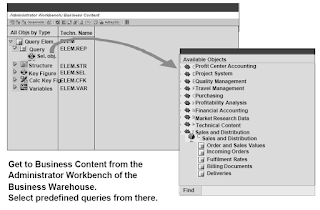 You can also copy several queries at the same time by pressing the control key when you select the definitons.In addition to query definitions, Business Content also contains global structures for key figures, restricted key figures, calculated key figures, and variables for your evaluations. 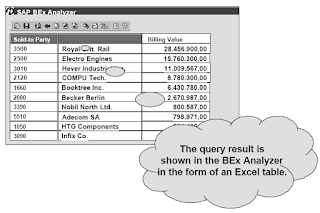 You can find the query definition you selected under Query in the BEx Analyzer, assigned to the corresponding InfoArea and InfoCube.A search function helps you to find the query quickly. You can either enter the description or the technical name of the query.When you find the query, select it with the mouse and confirm with OK. 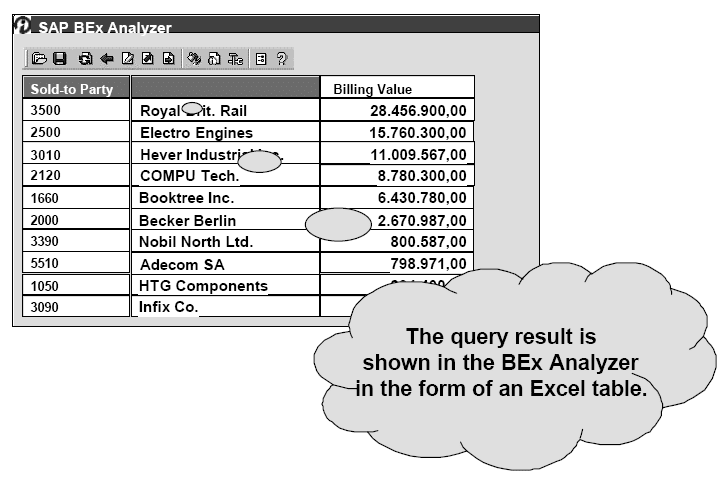 If the InfoCube contains data, the query result is shown on an Excel worksheet. When you execute the query, the result is presented in the form of an Excel table. You now have several options for navigating in the worksheet or changing its appearance. 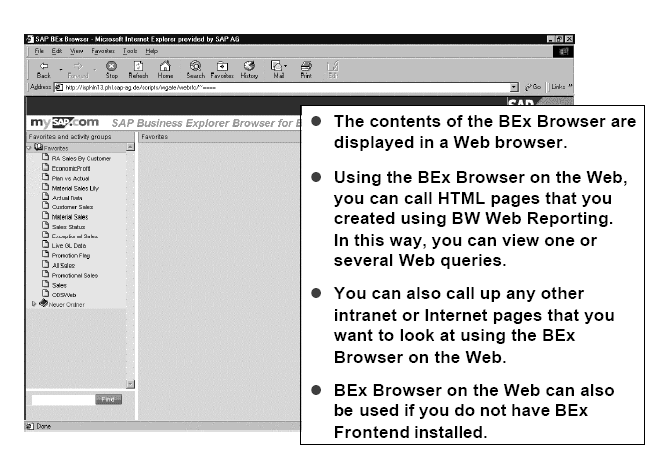 Use the BEx Browser to access all types of documents that have been assigned to you in the role maintenance, or that you saved in your favorites.The administration of the document types displayed in the BEx Browser is based on the role maintenance (activity group maintenance) in the SAP Easy Access Menu. 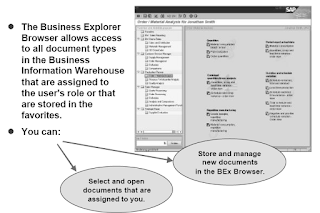 This is where you create new roles, assign them users, and maintain authorizations.You can select and organize documents in the BEx Browser. You can also create folders and specify how you want them presented on the screen regarding their position and any graphics used. 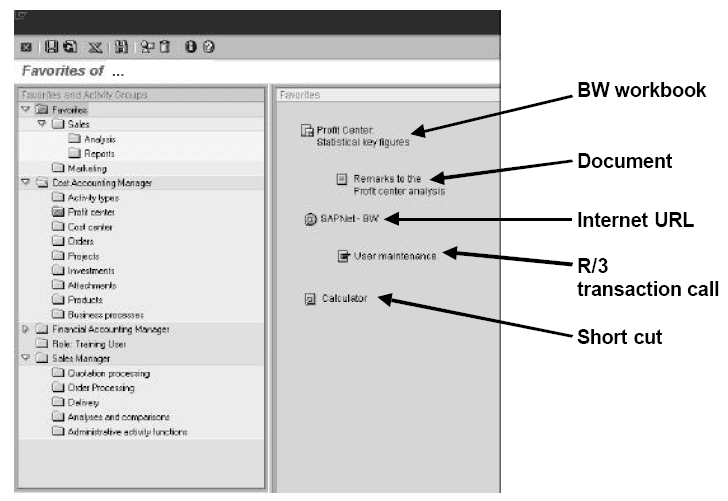 You can maintain your favorites and add new folders and objects.Alternatively, you can maintain your favorites in the SAP Easy Access Menu in BW. The objects are displayed in a tree. Open the 'Favorites' folder in the tree structure of the BEx Browser. Place the cursor on the right side of the screen and create a new folder (right mouse-click - New -> Folder. Give it an appropriate name and specify how you want it presented by choosing Select Color and Symbol. 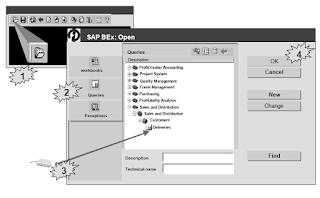 Open the BEx Analyzer and execute the selected query. Save the workbook by choosing Save -> Save as new workbook. Enter a name for the query and select the folder you created in your favorites. Confirm with OK. When you call the BEx Browser you see the name of the query in your new folder, as long as your favorites are open. Double -click on the name to start the query. Transaction calls for connecting R/3 Systems. You can organize all of these objects into folders and give them colors and symbols. 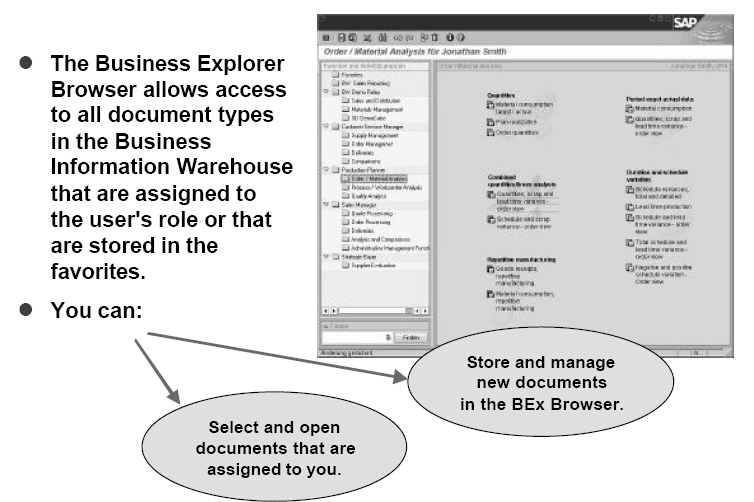 Business Explorer Browser on the Web allows you to display the contents of the BEx Browser (roles, tasks, favorites) in a Web browser.With the BEx Browser on the Web, you can call up Web queries that were generated with BW Web Reporting.What is more, you can call up any intranet or Internet page you want. Objects within the browser can be reached with a search function. 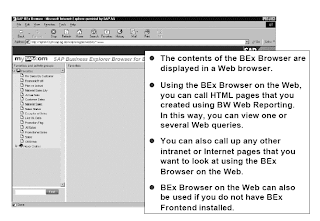 It is not possible to drag objects in the BEx Browser Web function. Neither can you mantain your favorites.